An interview with Immigrant Youth Coalition’s Communications Coordinator Yessica Gonzalez. The Immigrant Youth Coalition (IYC) is an undocumented and queer/trans youth led organization based in California, that mobilizes youth, families and incarcerated people to end the criminalization of immigrants and people of color. Through story-based strategies and grassroots organizing, IYC brings the struggles of directly impacted communities to the forefront of our movements to create social, cultural and policy change. 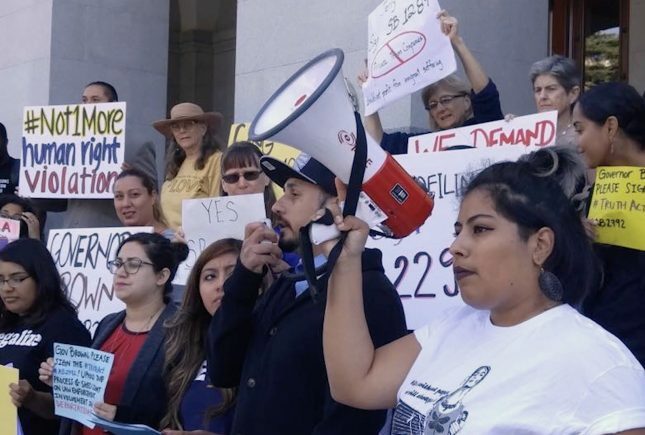 In the video above, IYC Communications Coordinator Yessica Gonzalez shares more about the importance of the organization’s work, as well as what it’s meant to receive support from Astraea. Learn more about Immigrant Youth Coalition. I think meeting other resilient queer, undocumented folks who have become my best friends, and creating a different world that we’re envisioning forward, that’s been one of the powerful moments doing this work. There’s a lot of media attention around immigrant visibility, and we always see the good, light-skin student who is valedictorian as the one who should get citizenship. So when there are other folks who don’t fit into that criteria, they’re easier to be targeted because then they don’t seem as the ones who are deserving of all these other treatments. A few years ago we launched a campaign called the TRUST Act to stop the collaboration between local law enforcement and immigration. That was really instrumental because it would stop people getting targeted. Or, at least, when they were stopped by police and asked for an I.D., or questioned for anything, they wouldn’t be directly funneled into a detention center, and it would give more security to folks who were victims of domestic violence, or who had been victims of a crime to call upon somebody and not fear that they would be deported or fear direct persecution or direct criminalization through immigration enforcement. We know that citizenship isn’t the answer because a piece of paper isn’t going to take away the anxiety, depression, trauma that a lot of people are going through or absolve the targeting and criminalization of folks. Colorism is a reality, so by saying “it’s beyond citizenship, and it’s about stopping deportations,” I think that is more of the framing that we want to go towards. Astraea was actually our first funder back in 2013, and thanks to the support of Astraea, we’ve been able to get more access to funds and sustain the work that we’ve been doing and supporting it through leadership development. And we are seeing other youth who are undocumented and who are queer creating more spaces for themselves. And, also, supporting other folks so we can continue the work and create long-term visioning. I think personally, growing up undocumented and getting to know other undocumented folks and knowing that we’re resilient people! Everybody thinks that we’re this sad story but no, undocumented people are great! Yeah, we’re hard-working but yeah, we also know how to have fun, you know? We also know how to smile. We also know how to laugh. We also know how to do other amazing things. And I think seeing somebody reunite with their family after they’ve been incarcerated or detained, being able to mobilize, empower themselves to tell other people about the work and that it’s okay to fight back and it’s okay to take on your own case. And then seeing them outside of a detention center, when they’re back with their community, back with their family, to me that has been the highlight of this whole work. And it always reminds me why we continue to do this.